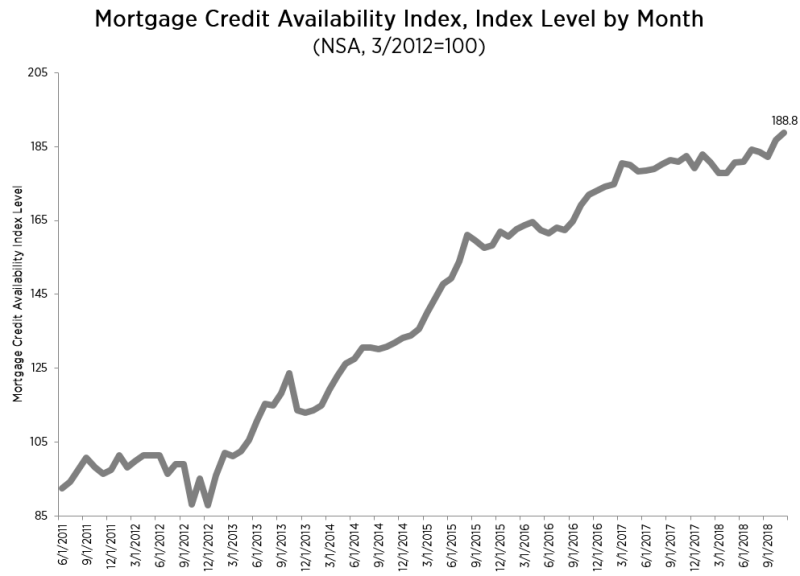 Access to mortgage credit moved higher in November, largely due to improved access to conforming mortgages. The Mortgage Bankers Association's Mortgage Credit Availability Index (MCAI increased 1.1 percent to 188.8. A decline in the MCAI indicates that lending standards are tightening, while increases in the index are indicative of loosening credit. The Conventional MCAI increased (2.4 percent) and the Government MCAI decreased (0.1 percent). Of the component indices of the Conventional MCAI, the Jumbo MCAI rose 1.1 percent, while the Conforming MCAI gained 4.0 percent. "The supply of credit continues to drift higher, driven once again by growth in the conventional credit space, while credit supply in government loans was essentially unchanged from the previous month," said Joel Kan, MBA's Associate Vice President of Economic and Industry Forecasting. "There were more mortgage programs offered with high LTV and low credit score characteristics - likely attributable to rising demand from first-time buyers. As seen in our weekly mortgage applications survey, average purchase loan amounts have moved lower in the second half of the year, which also supports first-timers' increased presence in the market." Added Kan, "Even with the deceleration in price growth in many areas, still high home prices continue to lead to increased credit supply for jumbo loan programs." The MCAI is calculated using several factors related to borrower eligibility (credit score, loan type, loan-to-value ratio, etc.). These metrics and underwriting criteria for over 95 lenders/investors are combined by MBA using data made available via the AllRegs® Market Clarity® product and a proprietary formula derived by MBA to calculate the MCAI, a summary measure which indicates the availability of mortgage credit at a point in time. The index was benchmarked to 100 in March 2012. The Conforming and Jumbo indices have the same "base levels" as the Total MCAI (March 2012=100), while the Conventional and Government indices have adjusted "base levels" in March 2012. MBA calibrated the Conventional and Government indices to better represent where each index might fall in March 2012 (the "base period") relative to the Total=100 benchmark.